I don’t do a lot of two ingredient drinks here, and that’s for a reason. After all, I’m not sure you really need my help to make a rum and coke, a 7 and 7, or a screwdriver. Still, as with the Rusty Nail and some others I can’t think of right now, there are a fair number of two ingredient drinks that seem worth exploring. Also, it’s the day after Thanksgiving and — especially if you dared to enter a retail store of any type today — you probably want to keep things simple. The Poker Cocktail is, as far as I can tell, one of the true obscurities contained in Harry Craddock’s “The Savoy Cocktail Book,” and I have no idea why that should be. It’s simple and, done right, it’s really quite tasty while offering the opportunity, if not the inevitability, of just a little bit of complexity. What, if anything, that has to do with poker, I couldn’t possibly tell you. 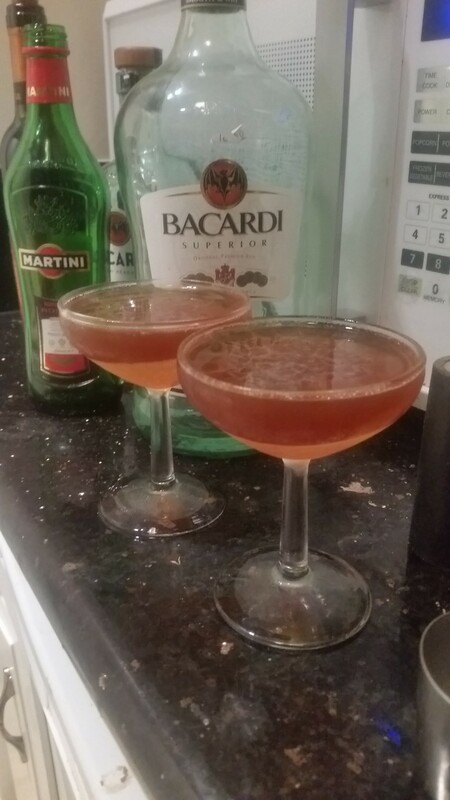 If you are following Harry Craddock’s original recipe — and I see no reason to mess with it — combine the rum and vermouth in a cocktail shaker with plenty of ice. Shake vigorously, and strain into a chilled cocktail glass. No need to even think about bitters, garnishes, or other such bothersome trifles. Alternatively, I won’t be too put out if you decide to stir your Poker Cocktail, the result will be slightly boozier and more forbidding, but you can make a case for it. My first go at this might have been the best. The original recipe actually calls only for Italian vermouth (once synonymous with sweet vermouth) and Bacardi rum. So, I tried plain old white Barcardi and good old sweet Martini, and it was grand. Simple, yes, but tasty and, thanks to the shaking, surprisingly refreshing. Sweet, but not remotely cloying. I also liked my results nearly as much when I went up a notch or two in class from regular Bacardi to Bacardi Maestro de Ron and also with Meyers Platinum Light. Brugal Especial Extra Dry also added an interesting bit of sophistication. On the other hand, I was slightly less consistently pleased when I started experimenting with different vermouths. Switching from Martini to Vya was an interesting change of pace the produced a perfectly decent drink that was maybe, however, a hair less delicious. Oddly enough, Carpano Antica, which is so great in so many drinks, was also a hair or two less great when I tried it…but maybe I just haven’t found the perfect light rum to go with it. The search continues!